Officers from The Salvation Army Southern Nevada Division are serving at four local hospitals where the victims are being treated. 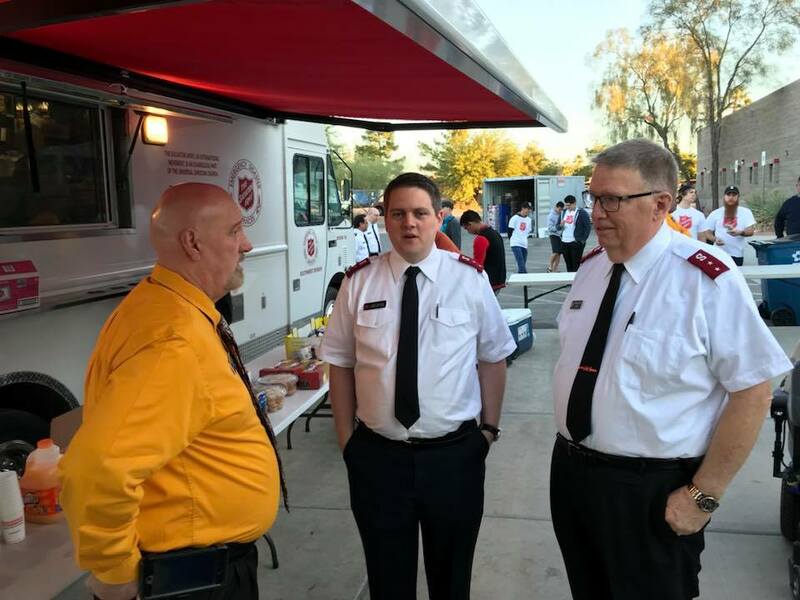 The Salvation Army Southern Nevada is providing emotional and spiritual care to those affected by Sunday night’s mass shooting in Las Vegas—the deadliest in modern U.S. history. So far, 58 people have been confirmed dead and over 500 have sustained injuries. “We ask that everyone please pray for the families and friends of those who have lost their lives or were injured, as well as the first responders and Salvation Army officers and employees who are serving and ministering to the community,” said Lt. Colonel Kelly Pontsler, Southwest Divisional Commander. Salvation Army officers are providing prayer and counsel at the two hospitals where the vast majority of victims are being treated: University Medical Center Hospital, which is currently on lockdown, and Sunrise Hospital. Several more officers have also been sent to Spring Valley Hospital and St. Rose Hospital, where other victims are being treated. According to Clark County Coordinator Randy Kinnamon, there is a tremendous need for life-saving blood donations, and people are encouraged to give at the Labor Health & Welfare Clinic, at 7135 W. Sahara, or any United Blood Services location. The Salvation Army has dispatched a mobile canteen to the United Blood Services location at 6930 W. Charleston Blvd. to provide food and water to those waiting in long lines to donate. The Salvation Army is also considering other locations in the city to station mobile canteens. Social Services Director Phillip Hollon is working with local first responders to determine other ways that The Salvation Army can be of assistance. Officials are also evaluating needs at the Thomas and Mack Center, which has be opened up as a shelter.